The Invincible Delwinor Pear tree is a tough and hardy tree so if you happen to be a lighthouse keeper on the Isle of "Barren and Weather Beaten" then this could be a tree for you. This pear tree is also one of the few that will flower twice. Once Jack Frost has buggered off you should see another flush of flowers which lengthens the cropping period enabling you to have to store less and have the pear fruits fresher. The first crop should be green and crunchy with the second crop being more yellow, softer and juicer. The Invincible Delwinor pear tree also has a high resistance to Mildew and Scab so if you live in the West of UK where it is a tad wetter then this would be a good choice. 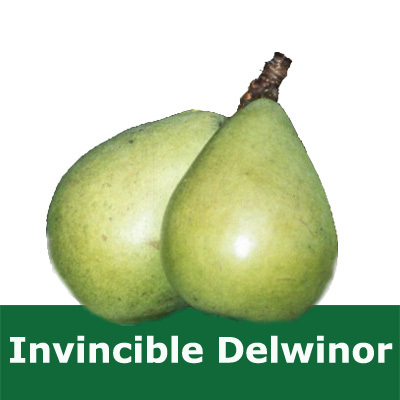 This is not to say that you could plant the Invincible Delwinor on a Scab and Mildew infested scientific research Island and expect to eat unblemished fruit, the clue was in the word "resistant". The blossoms of the Invincible Delwinor are also of a great deal of interest to the birds, bees and insects so expect organised wildlife tourist groups to be visiting your garden on a regular basis in the Spring. Fertility: C2 (SELF FERTILE) Does not require another pear tree to produce fruit however your harvest could be improved my having a pollination partner from C1, C2 or C3 groups.